Three experiences have shaped the way I now look at Nigeria. My current views are very different from those of the idealistic patriot that I was in 1993 who was willing even to risk his life to restore MKO Abiola’s mandate. I was also one of those in university who raged against the military regimes and felt that democracy was the best way forward for Nigeria. Boy! Was I wrong? As bad as the military governments were for human rights, I don’t think the injustices performed in those eras come even close to the injustices that Nigerians have suffered during our so-called democratic republics. My friend later died after a brief illness before he could “get his hands soiled”. I listened to his uncle’s advice and never got my hands stained. I learned more about what “uncle” meant when I escaped with my life after we tried to bring one of the government parastatals into the electronic age. We were warned via a phone call to my hotel at 2 am to leave Abuja the next morning or die. We left. We also left behind 8 million naira that was never paid to us for work that we had done. My friend Garth Ludely is a handsome British man of Jamaican origin. We had a ride on an Edo Line commercial vehicle between Lagos and Benin in the early 90s, and we started discussing Nigeria. His observation was simple but on point. He said that he realised that there was a single phrase causing all the problems in Nigeria because it encompasses the attitude of a majority of Nigerians to everything including governance. That phrase he said was “Wetin Concern Me”. That is our pidgin English phrase for “It is not my business”. Garth said that “Wetin concern me” allows people to abdicate responsibility for everything to others. They always expect solving problems to be another person’s headache. He said Nigeria was a lovely country with great potential but “Wetin Concern Me” was going to ruin us. He was totally right. It is apathy and abdication of our responsibility to irresponsible governments that has led us to the point where we are ranked at 136 out of 137 countries in a World Economic Forum (WEF) global competitive index on healthcare and primary education. Two core pillars of nationhood have most probably been permanently destroyed because we have always passed the buck to so-called “leaders”. I was Nigeria’s greatest defender until 2008. I would travel to America and tell those who had left to come back home or else they would miss out on the great new things that were about to happen back home. I convinced most of them that “Africa was rising” and we were going to become the new Billionaires. I believed that I had the right to say that as I felt I was doing great and business was booming. We were doing business in 13 countries in Africa. I was fit, rich and life was good until it no longer wasn’t. 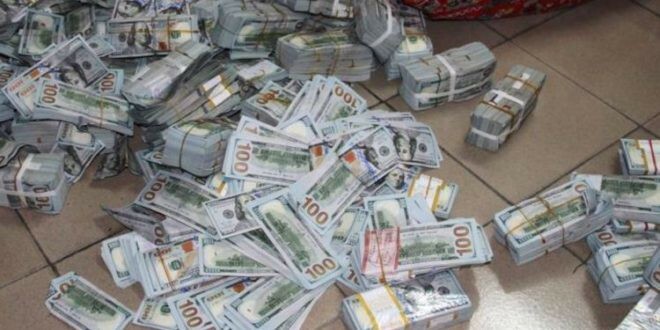 I had stupidly believed that all one needed to do in Nigeria was find a way to make money, and it would shield us from the greater problems in society which would gradually correct itself as more people hustled and became wealthy. I never figured out that hustlers play a zero-sum game and end up cancelling out each other’s progress. I thought all those who couldn’t hustle were lazy or unlucky. My experience and John Nash’s equilibrium theory has since proven this to be untrue. “Decisions that are good for individuals can sometimes be terrible for groups”. I firmly believed that Nigeria was only going through a rough patch until I had one of the biggest health scares of my life in December 2008. I had kidney stones, and there was not a single hospital in Nigeria at that time that had a lithotripsy machine to break the stones. It was a death sentence unless I could find a way to travel out quickly. I did travel out and never returned. I realised that wealth was meaningless in a place where a governor’s convoy had a standby ambulance instead of the governor investing in healthcare. “Living large” didn’t make sense if all the people you think were wealthy had one leg outside Nigeria in case disaster strikes. One of the most lucrative businesses in Nigeria at that time was emergency medical evacuation for the wealthy. My father died in Nigeria because he was not wealthy enough to be evacuated. I was reminded once again about the healthcare issues in Nigeria in a grim manner in May 2014 when I came to Nigeria for a visit, and while staying at a so-called “5-star hotel” in Victoria Island, the bathroom glass door broke while I had a shower and it nearly amputated my leg. I still suffer a slight limp from that incident. The hotel had no emergency facilities, and while I was almost bleeding to death inside a car as I was being taken to the hospital, I made up my mind NEVER to come back there to live if I survived. Things have indeed finally fallen apart. Proof of that from the WEF is once again below. The security situation in the country is worsening and it compounds the healthcare problem. If primary education has no hope, I wonder what we think the future will hold for us? I honestly do not admire those who are optimistic about Nigeria anymore. I think they more deluded than I was before December 2008. I am still Nigerian, and even though I have decided to go into self-imposed exile, I always worry about the country. I asked my son this morning what country he came from? He mentioned “Nigeria”. He identifies with the country of his origin that he has never visited. I will forever remain Nigerian because I was blessed or cursed with it depending on how one looks at it. Looking at the WEF rankings again, we show potential in areas like market size and labor market efficiency. Why has capitalism not lifted us out of our quagmire? Why is so much potential going to waste? I finally found the answer while reading Peter Thiel’s essays on “Zero to One”. Evil has a monopoly in Nigeria, and that is why it thrives. The people who gain the most from the chaos in Nigeria have created a barrier so great to surmount that it would take losing the entire country (as we know it) to uproot them from their positions. The kind of capitalism and governance we have are the wrong kind of monopolies. I believe that there are progressive monopolies who pride themselves in “doing no evil” and there are evil monopolies that thrive on just casually “doing evil” without scruples. I wrote an article in the Nigerian Guardian recently on payments (The long path to Nigerian payments innovation). I had to be nice because it was the Guardian. The bitter truth is that what is happening in payments with cabals holding us back is the same everywhere in all sectors. These cabals have created efficient monopolies of evil that continue to make Nigeria remain backwards. Nigeria’s problem is not that it lacks people with vision or intelligence, they just use it only for themselves. “Wetin concern dem?”. We have people who have determined that for them to survive, everyone else must lose. That is the classic monopoly/hustler template. I wrote another article a long time ago on “Nigerian Anyhowness” it has proven to be prophetic. Another truth about monopolists is that they never admit that they are monopolists. I have written online in the past that the Nigerian dream is to become an oppressor. I should modify that — “The Nigerian dream is to become a monopolist”. Our monopolists in Nigeria convince us that their monopoly is for our good. Banks tell us that the telcos are evil, and they are the good guys, but they slam us with levies and poor services daily. The dream belongs to the monopolist but the nightmare belongs to those who suffer from the effects of hostage taking. Monopoly may be good in business for the businessman, but it is disastrous when it comes to politics and governance. Monopolists will not willingly end their monopoly unless they are replaced by greater cartels. We are in a catch 22 situation. That is why I said, e no go better…for a very long time. There is no redeeming quality to Nigeria’s version of monopoly as it is purely based on greed and negative innovation. There is an unhealthy alliance between bad governance and innovation-less capitalism that prevents any possibility of self-correction. Instead of Zero to One possibilities, we are faced with a likelihood of “Zero to minus one” with negative consequences for everyone. Being rich in Nigeria also makes you an endangered species with people now physically kidnapping people for ransom and turning it into an enterprise of its own. The poor on the other hand are doomed from total systemic collapse and grasp at the rich like straws. As I mentioned in the Guardian article, Nigeria’s case is a bad example of “Wicked Problems”. We have to agree that there will never be a “solution”, only “interventions”. Nigeria’s Democracy has been hijacked by monopolies/cults and thugs. They will not let go unless they are removed by even worse monopolists and thugs or complete restructuring. The military voluntarily left but the current “Democratic and Captalist” crew will not. We can see now that the military were not the bad guys after all? Can the Nigerian situation be reversed? I doubt that it will be in our generation or the next. Peter Thiel explains how China views its own case and why Determinate Pessimism is helping it try to drag itself out of a pit for the benefit of future generations. The China view is that there is indeed a calculus as to what to do to improve things for society. Things are determinate. But when you go through that calculus, there’s no cause for celebration. China will get old before it gets rich. It is forever destined to be a poor version of the U.S. It can and will copy things. But there’s not enough time to catch up, even if it executes perfectly. This explains why you end up with all these things that seem draconian from a more optimistic perspective; e.g. the one child policy, massive environmental pollution, and thousands of people dying in coal mines each year. The fundamental view is pessimistic, but in a very determinate, calculated way. And then there is the pessimistic indeterminate quadrant. This is probably the worst of all worlds; the future isn’t that great and you have no idea what to do. Bill Gates who has invested so much in Nigeria’s progress has sounded the warning to us that the government MUST invest in its people. The WEF statistics are very dire. We cannot pretend that they mean nothing. Doing that is suicidal. 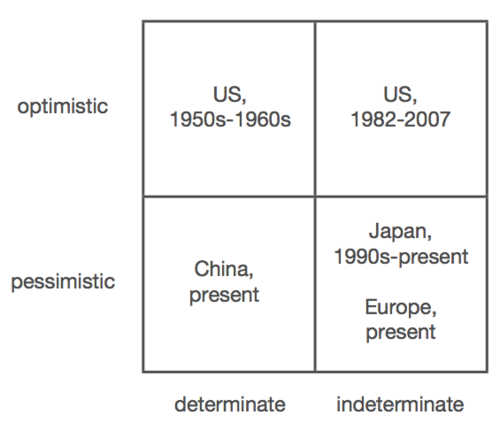 Nigerians believe that they are in the “Optimistic Indeterminate” quadrant when they should be in the pessimistic determinate quadrant. Nothing short of facing hard facts and taking determinate action will reverse Nigeria’s course to chaos. Chaos that benefits only a few.